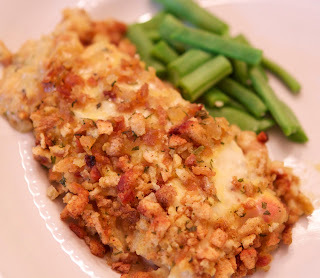 This prep ahead chicken dish is great weeknight comfort food! The chicken is topped with a thin slice of swiss, covered with a creamy sauce and finished off with a layer of buttered stuffing. It's moist, flavorful and very filling! If you are interested in buying organic ingredients I found some great brands at my local grocery store! I used Arrowhead Mills Organic Herbed Stuffing Mix and Pacific Natural Foods Organic Cream of Chicken Condensed Soup and the results were amazing. Prep Ahead Plan: Take 10 minutes and prepare this whole chicken dish in a 9 X 13 pan the night before. Super easy to mix it together and clean up takes less than 5 minutes. Love that! Arrange chicken in a greased 13 X 9 baking dish. Top with Swiss cheese slices. Cover and bake at 350 degrees F for 40-50 minutes. Enjoy! Copyright © PrepAhead and Dine In: swiss chicken. All Rights Reserved.